Plumbing repairs and pipework installation made easy with a variety of modern fittings. Plumbing repairs and installation can be made much easier with a advent of modern material and fittings available on the market today. Present day plumbers have flexible options to plumbing repairs that plumbers in the past didn’t have. The choice of materials to be used on a task can either be plastic or copper as the primary conveyor of water, this choice is optional. However an experienced plumber will also be aware of the regulations that are relevant to the pipe work installation exposed to the high temperature of the central heating system. What types of options are there available? traditionally cooper pipe is sold in lengths of 2 or 3 meters, but plastic pipe because of its flexibility can be package as a coil and is sold in lengths up to 25 meters. Which ever of these two pipes are used as the primary material for pipework installation, joints fitting will have to be incorporate at an early stage of the construction. One of the flexible options to plumbing repairs and pipework installation is the variety joint fittings that can be used when constructing plumbing joints. What are the options available that can reduce the time sent on plumbing repairs? Its quite often the case whenever a plumber embanks on a project personnel preference to wards fittings is why a particular product is chosen above others. Becoming familiar with the use a particular product takes time, after repeated the use of a product the installation process becomes second nature. With this comes the speed know how and trust in a products longevity, this is a crucial element that promotes popularity and repeated use. There are three fittings that are most often used, compression, push fit, and end feed. The most popular of these would be the End feed, an end feed joint is commonly found below floor boards it is a sturdy and robots way of completely a joint in areas that once sealed are difficult to access. This added level of security ensures that any movement to the pipe will be held secure eliminating the possibility of losing. 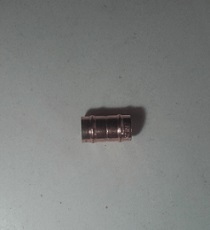 The process involved in sealing this type joint is heat, the application of heat to solider will eventually melt the solder that is soft and has a lower melting temperature than that of the cooper. Because a soldered joints are extremely secure and durable it is favoured above others for use with gas and central heating installations. New buildings often incorporate plastic fittings rather than the traditional cooper. Plastic joints can drastically reduce time sent creating joints, the simplicity of simply pushing the pipe into the fitting only takes a couple on minutes. Whereas creating joint using some of other methods requires a more preparation this all takes time. Small reduction to the time spent on pipework installation will drastically add up over many hours or even weeks spent on site. This is properly one of the fundamental factors why push fit joints are commonly used on building sites where time constraints are in place in order to meet deadlines. One of the creative elements to a plumbers skills is the construction of pipework that is visually pleasing joined together using the appropriate joints. Initiative new ideas such as metallic push fit joints are now available, this fitting will help to maintain a metallic look to pipework constructed using cooper. This is another easy to use options to be considered when some of the other joining methods become impractical. Compression joints can be found where other fitting may be impractical. A compression fitting can be easily identified, it consist of a male and female threaded connection and an live. Radiator valves are connected using this method. 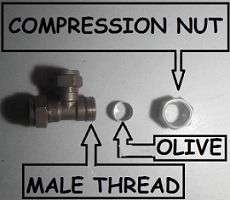 The nut is tightened compressing a small ring called an olive into the joint creating a water tight seal. A compression joint gives a plumber the ability to seal joints in areas where the application of an heat sealed joint becomes a hazard. Typically compression are constructed using a none corrosive metal, a metallic material such as this is ideal for use in connecting the central heating supply pipes to the boiler. With a boilers maximum temperature at a stretch 75c, a metallic joint can easily withstand in excess of this temperature. Joints like this are very secure when compressed using the correct method, seated between the joints are fibre washers specially design to create a water tight seal. The none corrosive and resilient elements of this joint will rebel years of exposure to water and the fluctuating temperatures of the central heating supply pipes. This type of joint is a tried and tested method that has been in use for may years. 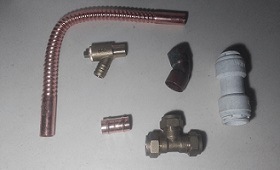 Manufactures supplied these fittings as part of the package with boilers. Not only dose this fitting connect the central heat supply to the boiler it is also an isolation point, safely restraining the central heating water supply whilst carrying out repairs. I have been searching the internet for this, and I am glad I found it here! Thanks.